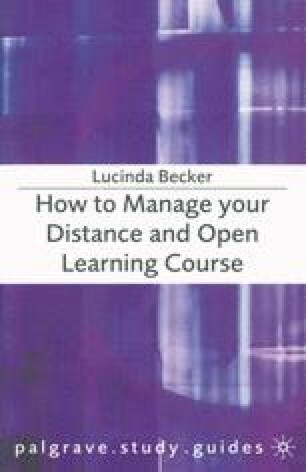 You may already have chosen your distance and open learning course, but it is still a useful exercise to work through the factors involved in making such a decision. This will help you to analyse the strengths and weaknesses of your chosen course, and the impact that it might have upon your life; it will also prepare you for making choices between further courses in the future. Within this chapter several key issues will be explored: your financial commitment to a course, the ways in which your course can help you to further your career, the academic value of your course and the impact that it will have upon your domestic situation. Each of these factors will have a bearing, to a greater or lesser extent, upon your decision to commit to a particular course of study, but first it is helpful to define what is meant by distance and open learning.